The Zuni Indians have been a strong part of the American Southwest culture; with many anthropologists believing that the Zuni tribe have been living in the same area of land for nearly 3,000 to 4,000 years. The Zuni Pueblo is located in northwestern New Mexico. The 450,000 acre Zuni reservation spans across two counties, McKinley and Cibola and the tribe also has land in Apache County in Arizona. Today, there are roughly 12,000 Zuni living on the New Mexico reservation. The tribe still inhabits the ancient homelands along the middle stretch of the Zuni River. 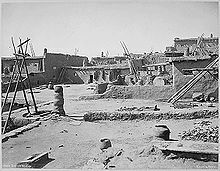 The area is home to several ancient settlements and villages where the tribe once built compact, multistory houses and remains an important part of Zuni culture. According to the official Zuni website, Coronado and his men called the ancient settlements the “Seven Cities.” Coronado believed the cities were mystical and set off toward Zuni land in search of treasure. In the 1500s, Francisco Vasquez Coronado led a bloody military exhibition into Zuni lands, sparking a fierce battle between the tribe and Spaniards in what is now part of Mexico. Coronado was driven out by the Zuni and barely escaped with his own life. Zuni history dates back to prehistoric times. Historians believe the Zuni moved into western New Mexico before 2500 BC. The first people to inhabit the area hunted big game. After 2500 BC, they hunted small game and made the first attempts at agriculture. The Zuni language is believed to be more than 7,000 years old. The Zuni Indians have been making beautiful weaved baskets and pottery since 700 A.D. The tribe constructed complex and elaborate villages with plaza-like city centers. During what the tribe describes as the “Pueblo period” population of Zuni Indians boomed and prehistoric towns were constructed in the Zuni River Valley. The Zuni Indians still live in their ancestral homelands, which they’ve had to defend against Spaniard colonists who tried to force Christianity upon the tribe. In 1848, New Mexico and Zuni became part of the United States and the tribe signed treaties allowing Zuni Indians to expand agriculture, jewelry making and trade with other tribes as well as outsiders. Zuni jewelry and pottery is still a major part of trade for the tribe as well as tourism. Thousands of visitors travel to northeastern New Mexico every year to see the ancient dwellings and learn more about the Zuni Indians.